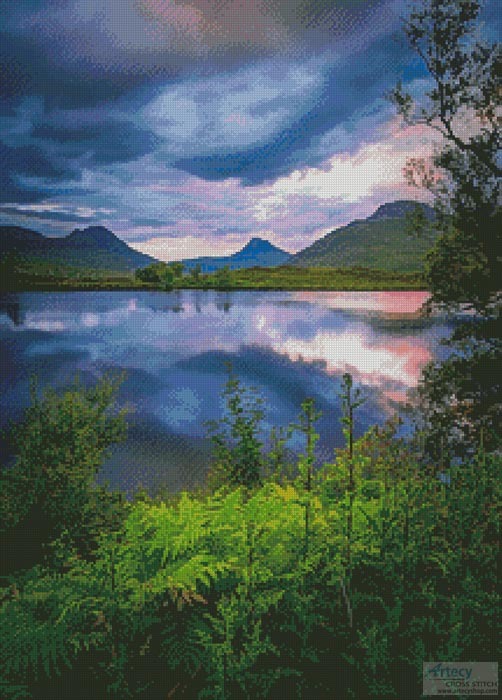 Stac Pollaidh Sunset Cross Stitch Pattern to print online. This counted cross stitch pattern of Stac Pollaidh at Sunset was created from a photograph copyright of Chris Combe - Flickr. We also offer a mini version of this pattern which you can find here. We also offer a cropped version of this pattern which you can find here. If you already have this full version pattern and would like to stitch this smaller cropped version there is no need to purchase the cropped version as well. To stitch the cropped section lay the full version pattern out in number order on a table or floor and look at the number grid at the top and left. You will start at 13 stitches across and 28 stitches down and go to 212 stitches across and 252 stitches down. We also offer another cropped version of this pattern which you can find here. If you already have this full version pattern and would like to stitch this smaller cropped version there is no need to purchase the cropped version as well. To stitch the cropped section lay the full version pattern out in number order on a table or floor and look at the number grid at the top and left. You will start at 10 stitches across and 2 stitches down and go to 214 stitches across and 151 stitches down.